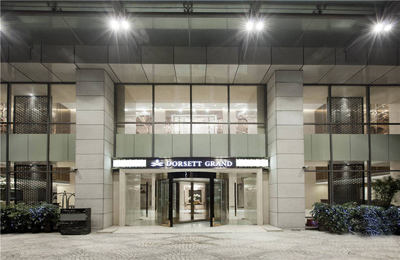 Dorsett Hospitality International Limited (HKEx Stock Code: 2266), set up in January 2007 and listed on the Hong Kong Stock Exchange in October 2010, is a subsidiary of Far East Consortium International Limited. Our hotels can be found in Hong Kong, Shanghai, Chengdu, Wuhan, Jiujiang, Kuala Lumpur, Johor, Labuan, Singapore as well as in London.Located at the famous historical Luoma Market area of Chengdu, Dorsett Grand Chengdu managed by Dorsett Hospitality International is close neighboring with most bustling downtown Chunxi Road and well-known Chengdu Sports Center. The metro line 1 and line 4 are just right to the hotel door way, providing the most convenient urban transportation network for all kind of business travelers and tourists. The Dorsett Grand Chengdu offers 556 spacious and inspired luxury guest rooms and suites, which are exquisitely appointed with contemporary furnishings. The 700m2 pillar free multi-functional ballroom and 8 meeting rooms make the hotel a reliable resource for the most demanding guests. The warm, casual ambience at Yue Rong Café is perfect for either a bite alone or with a large group. Executive Chef oversees the show kitchens of Tandoori and Pizza ovens, flaming charcoal grill and rotisseries, sushi and teppanyaki bars and more.While sticking to the traditional culinary art and also a healthy dose of flavorful dishes from a number of cities across mainland China Chef at the helm, brings up a newly Tan Fu, Canton & Sichuan savor at Fu Yue Xuan Chinese Restaurant。The hotel is dedicate to being the upscale segment among global hotels and will bring the Asian inspired hospitality to the world.